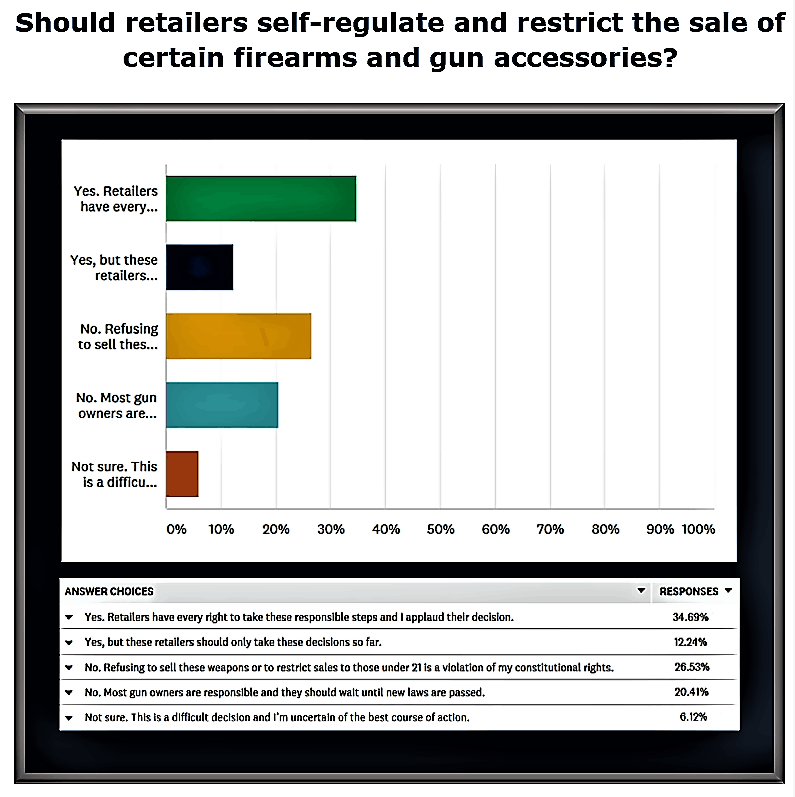 LPM Insider Survey Results: Should Retailers Restrict the Sale of Firearms? Readers Are Split. In last week’s LPM Insider Survey, we discussed the decision made by several retailers to restrict purchases of certain firearms and gun accessories, or simply no longer sell these items rather than waiting for legislators to make up their minds on what should be done. Others have raised age restrictions and will no longer sell some or all firearms to those under 21 years of age. Gun control issues have been an ongoing topic, and recently back in the spotlight as a primary focus of attention following the recent tragedy in Parkland, FL, and the dozens of other incidents involving gun violence in recent years. Debates have raged as the public seeks action. While 97 percent of the public agrees that further gun control in some form needs to be implemented, legislators remain deadlocked on the best ways to address this polarizing issue. Most recently, another retailer took additional steps in the assault rifles issue. Last week, Kroger, the largest supermarket chain in the United States, made the decision to remove publications about assault rifles from its stores, wading further into the debate on gun control. Should we raise the age limits on the purchases of certain firearms? Should certain firearms be banned altogether? Should background checks and waiting periods be mandatory for every gun sale? Should bump stocks and high-capacity ammunition magazines be banned? Should teachers carry guns? Our survey participants shared passionate comments on both sides of this debate, resulting in a virtual stalemate in the discussion, with 47 percent agreeing that retailers should self-regulate and restrict the sale of certain firearms and gun accessories, 47 percent disagreeing with this decision, and 6 percent unsure which is the right decision. Approximately 35 percent of respondents believe that that retail companies have every right to take these steps and agree with this decision, while 12 percent agree with the decision, but feel that retailers should only take these steps so far. Contrarily, 27 percent feel that refusing to sell these weapons or to restrict sales to those under 21 is a violation of their constitutional rights, and 20 percent believe that most gun owners are responsible and retailers should wait until new laws are passed. Retailers have every right to dictate who they will and will not sell to, and they’ve made the right decision. Private citizens don’t need assault-type rifles. They don’t need high-round magazines. They don’t need bump stocks. Hunt to your heart’s content – but don’t allow people to buy weapons solely intended to cause the death of a lot of people. It’s wrong. Period. GUNS kill people. If you can’t see the importance of being a responsible gun owner, you shouldn’t own a gun. Bravo to the retailers that stood up! When 97 percent of the people agree on something this important, there’s something wrong with our political system if we can’t find a solution. It’s disgusting that money and special interests are more important than our children. Buyers have the right to go elsewhere, too. Policy and common sense need to compliment the protection of the public within the constraints of law. Whereas law protects the publics rights. Neither are mutually exclusive or all encompassing, they should complement each other. Almost none of the ‘mass shooter’ suspects in recent years has been under 21 or obtained their firearms illegally anyway. If you’re going to impose unconstitutional restrictions on 18-20-year-olds due to age, maybe we need to question if they are ‘old enough to vote’ too? Taking accountability for the responsible handling of gun sales is positive step within the laws of the land. Paying close attention to persons purchasing the firearms and reporting suspected activity would also be a prudent move. Retailers have every right to sell or not sell what they want, within the law. Their right is to be applauded, not their decision. Responsibility, common sense, and the safety of our children should reign over special interests and politicians that line their pockets while speaking in forked tongues. We don’t want to take guns from hunters and sportsmen – we want to take assault rifles from killers. Well played, retailers! None of the above. Retailers have the right to decide what they will sell and how they will sell it. If they want to put restrictions on guns or not sell them at all, that is absolutely their right. However, I can’t say that I “applaud” a decision to do that. While everyone wants to make these issues about guns, there are so many other, realistic things we can do to prevent these tragedies. Putting restrictions on firearms, or completely outlawing them is a “knee-jerk”, “feel good” response, that will do nothing. Thousands of illegal weapons come into this country every year. Passing a law to “ban” guns, won’t stop that. It also won’t make all of the guns that are already out there, just “disappear”. Guns will ALWAYS be around. Let’s make some realistic and common-sense decisions. Why don’t we have controlled access with metal detectors at every school? Why don’t we have armed guards at every school, like banks, federal buildings, etc.? Again, while I don’t agree with these decisions by retailers, I certainly agree that they have the right to make that choice. Changing the age to buy a firearm does nothing to stop criminals, who are breaking the law in the first place. If our government can’t figure it out why not have responsible corporate citizens make a stand to cease the sale of assault weapons and high capacity magazines. I do applaud their courage knowing the fallout means lost revenue. Lost revenue or lost lives – you choose. Retailers have every right to dictate who they will and will not sell to, as long as it is within the bounds of the law. People and customers need to straighten up and fly right – and be responsible for their own actions. The real problem: our court system. Crimes need to be punished accordingly and we as a country need to stop soft-soaping drugs, theft and all of those other crimes that the democrats want defined as “petty”. Crime is not petty. Start prosecuting the offenders, help parents keep their own kids safe and sane and make everyone accountable for their own actions. It has to start there. Retailers’ decisions will impact customers, and thus the bottom line, but it won’t make us any more or less safe. Prosecutors need to get on board. My full (and personal) belief is: “NO they shouldn’t because most gun owners are responsible and they should wait until new laws are passed, but YES, they totally have the right to do so.” Let’s all analyze the real profitability that these sales had in any of these retailers making this shift before they are applauded as great humanitarian companies. If the financials substantiated the continued sales of these types of weapons they would not be making these moves. These are businesses. If cigarettes had increased profit margins and mitigated shrink they would be brought back to many of retailers that had previously banned the sales for moral reasons. They can do whatever they want, but claiming they are doing it for ethical/moral reasons is inappropriate. I would be happy to be proven wrong, but the potential for declining sales from the ‘left’ or inauspicious sales from the ‘right’ is the real motivator. As much as I respect the rights as a private company to decide what they want to or don’t want to sell, I have the right as a consumer to never shop there again. It depends on the type of retailer. Private retailers have the right to restrict sales however they wish. It gets grayer with public retailers, who have a responsibility to their shareholders first. That being said, in this social media focused work of public shaming we live in, it may behoove all retailers to stay on the good side of social media followers, as that has been a driving force with brand appearance as of late. Do you have any additional thoughts? Let us know what’s on your mind in the comments below.